Last year a record number of Americans started companies. Here's why becoming your own boss has become a national obsession. (FSB Magazine) -- Today entrepreneurs are America's role models. Almost everyone wants to own a business - from teens and college students, who are signing up for entrepreneurial courses in record numbers; to those over age 65, who are forming more companies every year; to recent immigrants, who in 2005 started 25% more companies per capita than native-born citizens did. We are in the midst of the largest entrepreneurial surge this country has ever seen. According to Small Business Administration projections, nearly 672,000 new companies with employees were created in 2005. That is the biggest business birthrate in U.S. history: 30,000 more startups than in 2004, and 12% more than at the height of dot-com hysteria in 1996. And the trend shows no sign of abating. The Bureau of Labor Statistics found that more businesses were created in the first quarter of 2006 than during the same period the previous year. Not only are more Americans launching small businesses, but most others are dreaming about it: Sixty-six percent of respondents in a 2006 Yahoo Small Business and Harris Interactive survey said they wanted to start a company someday; 37% of those said they hoped to do so within the next five years. All these nascent businesses require services, technology, and expertise - demands that have launched an echo boom of small businesses seeking to serve other small businesses. "It's such a huge market," says Gourab Nanda, 34, who started MyBusinessAssistant.com last year to provide virtual business-management solutions to small companies. "All you have to do is identify your customers, provide the services, and keep prices low." The current entrepreneurial boom is not only larger than that of the mid-1990s, but also more diverse. Everyone is partaking of this surge - women, minorities, immigrants, teenagers, and corporate refugees alike. But the diversity is more than demographic; it extends to the companies themselves. The last startup expansion was fueled mostly by technology firms. While plenty of those are still being launched, the number of new service companies - which include tech firms - fell by nearly 14% from 1996 to 2005, according to the Kauffman Foundation (www.kauffman.org), which tracks and promotes entrepreneurship. Meanwhile, some old-school sectors are enjoying rapid growth. Since 1996 the number of construction startups has jumped 7%, and manufacturing has grown by a remarkable 43%. And yet it's arguably less risky to create a business now than ever before. A half-decade of rock-bottom interest rates has made it easier and cheaper for new entrepreneurs to borrow startup funds. Meanwhile, venture capital funds and other private equity investors are once again pouring money into young companies. " We are figuring out new ways to bring increasingly huge amounts of capital to startups," says Carl Schramm, head of the Kauffman Foundation and author of The Entrepreneurial Imperative. Schramm also points out that even as startup money is becoming more readily available, plummeting technology costs make it less necessary now that entrepreneurs often can purchase powerful computers and software without maxing out their credit cards. Meanwhile, it has become easier for entrepreneurs to start new companies without quitting their day jobs. 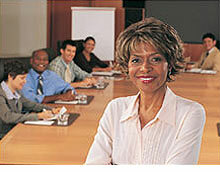 According to the SBA, the total number of firms with no employees grew by 26% from 1997 to 2004, to 19 million. A little more than half of those companies are run by workers with another primary source of income. If the nation's love affair with entrepreneurship continues, then we are in for a bright future. Despite their competitive reputations, entrepreneurs are more likely to get involved in their communities, through service on elected and appointed boards and other types of volunteer work. And they lead the nation in charitable donations. According to a study from Bank of America and Indiana University comparing wealthy individuals from various backgrounds, those whose money came from entrepreneurial activity donated an average of $232,206 in 2005. That's more than twice the amount given by the next highest group, those with inherited wealth. They averaged only $109,745. And those whose wealth came from real estate tailed the group, at $11,015. Indeed, innovative entrepreneurs may help keep the country afloat in a time of global uncertainty. Even as emerging overseas economies, including India's and China's, become more competitive, no other country can rival America's appetite for entrepreneurial experimentation. "That's a great thing about America, that our culture accepts this risk and accepts people who try new things," legendary computer entrepreneur Michael Dell, chairman of Dell (Charts), said in a recent interview with FSB. "Many nations have capital, many nations have smart people, but no nation really compares to the U.S. in terms of its willingness to accept risk takers in society." This article was adapted from the February issue of FSB magazine. For the complete article, click here.